Eric Does Dudes – what do you think? “I’m not a prude at all,” he says. “I shot a very, very graphic scene two days ago with a man. Personally, I’m OK with this. I don’t think this is out of character at all – but I know that some of you have very strong feelings about Eric doing dudes. So let us know what you think in the poll. Who do you think the lucky man will be? Lafayette? Godric in a flashback? Someone else? Time for a poll….simply because my brain is exploding with the possibilities! According to Eric, we have a rat in the house. Someone tipped Victor off about the Fae war. And that someone gave him enough information that he ended up sitting in Fangtasia the night all hell broke loose, with his posse and his silver chains, just waiting for a phone call. Vote in the poll and don’t forget to leave your conspiracy theory in the comments. Poll – Who’s your Second for Book Sookie? Some discussion in the comments on an earlier post inspired me to make a new poll. If Eric is not to be Sookie’s HEA in the books, who would be your second pick? And why? Vote below, and don’t forget to leave your reasons/rants/tinfoil hat conspiracy theories in the comments! 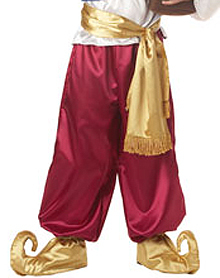 And the winner of the most hideous, cringe-worthy fashion crime in Sookieverse with almost HALF the total vote is…..
His Purple Pansyness in Genie pants! 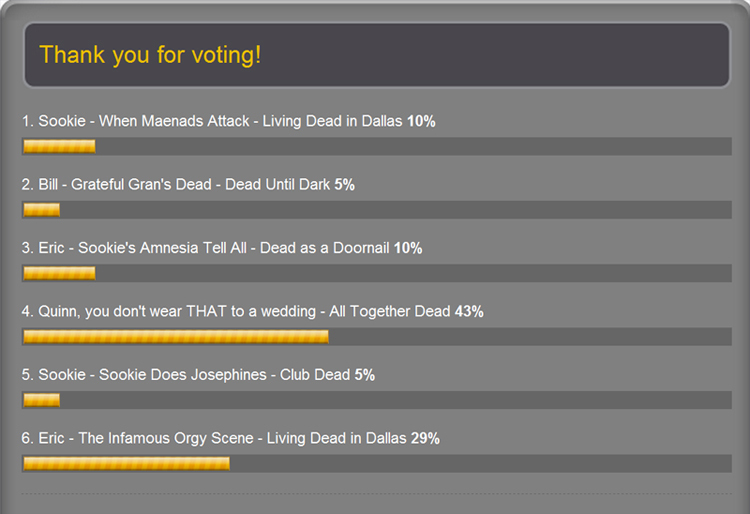 I’m actually surprised – I thought Sookie would take the crown. But considering Quinn’s popularity around here *cough*, his victory might have been a tad predictable. Eric came in second in his lycra teamed with a trenchcoat travesty. The rest of the results are below. That was lots of fun, I had such a giggle finding the pics and writing the posts. It’s the final day of Fashion Hell, and we’ve saved the best for last. Don’t forget to vote at the end of this post! This is the stuff of Sookieverse legend and it really needs no explanation. But what the hell, we can never go here too many times right? Hot pink spandex pants, complete with aqua swirls and a trenchcoat…on a 6″4 viking. I realise this will be a controversial inclusion. I know most of you love this scene. And I know he was playing dress-ups for a reason. But what we love about this outfit is what it says about Eric’s personality. The outfit itself? Admit it – no matter how hot he looks in your imagination dressed like that, you are deluding yourself. You are. Although, I will admit that this outfit does do justice to the GP. Look at me with a straight face and tell me you fantasise about this. Vote away and leave your reasons in the comments. Results will be up in a few days.